Kenya’s interior minister, Joseph Nkaissery, said that 147 people had been killed, including four attackers — making it the deadliest terrorist attack in the country since the 1998 bombing of the American Embassy in Kenya’s capital, Nairobi. The minister contended on Thursday night that the harrowing siege at the university had ended, and that security forces were carefully sweeping the campus for any remaining threats. Kenyan security forces surrounded the campus of Garissa University College and clashed with the gunmen throughout the day, eventually cornering them in one dormitory, official said. 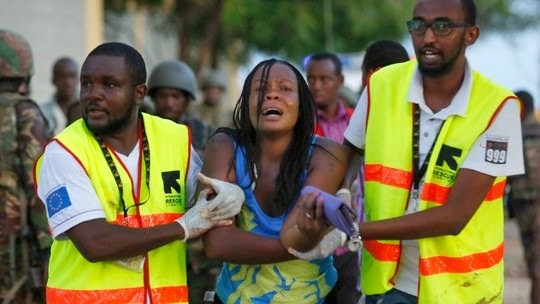 Abdikadir Sugow, the spokesman for the Garissa county government, said the gunmen were seen wearing “combat gear,” including what appeared to be “either bulletproof vests or suicide bomb vests.” The Shabab, an extremist group based in Somalia and affiliated with Al Qaeda, issued a statement through a radio station it controls claiming responsibility for the attack. In an audio message released on Thursday, a Shabab spokesman, Ali Mohamoud Raghe, said the attack had been carried out because “the Christian government of Kenya has invaded our country,” a reference to the Kenyan military’s 2011 incursion into Somalia to oust the Shabab from its strongholds. The siege was a devastating blow in a country that has long been a front-line state in the battle with Islamist extremism. In 2013, the Shabab mounted an attack on a Nairobi shopping mall that turned into a four-day ordeal, shaking Kenya’s prized sense of stability and leaving at least 67 people dead. The attack came just days after President Obama announced that he will visit Kenya in July, his first trip to his father’s homeland since taking office. Mr. Obama had stayed away until now, at least in part out of concerns about political instability in the country. The White House issued a statement condemning the attack and vowing to continue assisting Kenya in fighting the Shabab, but it offered no indication whether the episode would change Mr. Obama’s travel plans. “The United States stands with the people of Kenya, who will not be intimidated by such cowardly attacks,” Josh Earnest, the White House press secretary, said in the statement. The Kenyan authorities offered a bounty of 20 million Kenyan shillings (about $215,000) on Thursday for information leading to the capture of Mohammed Mohamud, who they said was the “most wanted” suspect in connection with the university attack. They said Mr. Mohamud was also known by the names Dulyadin and Gamadhere. The disaster operations center said that four critically wounded people had been airlifted to Nairobi, the capital, for treatment. The attack began about 5:30 a.m., when the gunmen forced their way onto the campus by firing at guards at the main gate, according to a statement issued by the office of the inspector general of the National Police Service in Nairobi. The police surrounded and sealed off the campus, and by 11 a.m., three of the college’s four student dormitories had been evacuated, while “the attackers have been cornered in one hostel,” the Interior Ministry said on Twitter. Joseph Boinet, the chief of the Kenyan police, ordered a curfew of 6:30 p.m. to 6:30 a.m. in four counties in northeastern Kenya, including Garissa County, to remain in effect for two weeks. The town of Garissa is about 90 miles from the Somali border. Kenya’s struggles with the Shabab have been going on for years. In late 2011, citing a string of attacks and kidnappings in its country, the Kenyan military charged across the border into Somalia, sending troops, tanks and aircraft to fight the Shabab. The military later acknowledged that the invasion had been planned well in advance, part of an effort to protect Kenya’s borders from the violence in Somalia and to safeguard Kenya’s economic interests, including a huge port to be built just 60 miles south of Somalia. he incursion managed to dislodge the Shabab from vital positions, but it raised fears of reprisals. The Shabab immediately vowed to retaliate, and many Kenyans worried that the military campaign would incite terrorism inside Kenya — a fear that seemed to culminate in the attack on the Westgate shopping mall in Nairobi, a gleaming symbol of Kenya’s modernity, wealth and relative peace. The Shabab began trying to affiliate with Al Qaeda as early as 2009, but Osama bin Laden kept them at arm’s length when he was alive, and internal documents have revealed that he was uneasy about the group’s murderous tactics, including the indiscriminate killing of Muslim civilians. The Shabab did not become an official branch of Al Qaeda until February 2012, almost a year after Bin Laden’s death. Since then, the group has maintained that it tries to minimize Muslim casualties, though Muslims continue to be targets in many of their operations. During the shopping mall attack, gunmen separated Muslim from non-Muslim civilians by asking religious trivia questions (“What is the name of the Prophet’s mother?” “What is the name of his first wife?”). The “nonbelievers” were killed on the spot. In 2014, the Shabab attacked a church in the coastal town of Likoni, and carried out two attacks on buses in the northeastern county of Madera. In those attacks, too, riders were separated according to religion, and a total of 64 were killed, including a group of teachers returning home from vacation. The group has actively recruited and radicalized young people in Kenya, especially in economically depressed areas along the Indian Ocean coast where tourism, a vital industry for the country, has suffered badly because of terrorist activity. Recent security warnings have emphasized a continued risk of attack by the Shabab. In March, the embassies of Australia, the United States and Britain issued security alerts about possible terrorist attacks.